And by “legs” I mean, for example, that you’re not waiting for the dahlias to bloom, with little to look at before or after. Staying power. Where summer turns buggy and humid, a garden’s legs may involve leaping over the miserable months with a firm landing in autumn. How one goes about giving a garden legs will be, obviously and appropriately, a uniquely personal and regional response. Back in May, the view from the kitchen windows. This may not be enough of a summer garden for some. I’m just happy the proportions are hanging in there and there’s enough going on to hold my interest. Unless you’ve got a second home to retreat to mid-July, the garden has to be your sustenance, your reason for coming home after a grueling workday. And I’ve had too many out-of-control gardens by July. But it is a compromise. 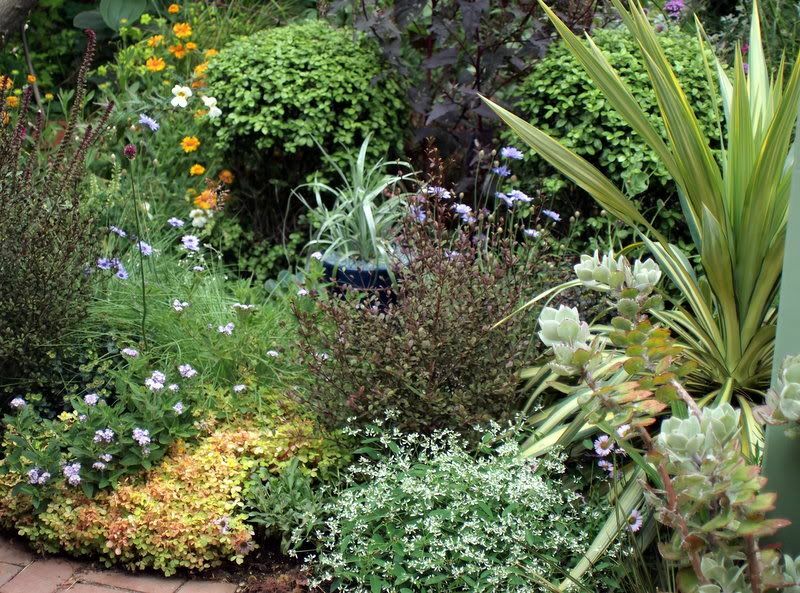 For me, an explosion of perennials would mean looking at mud the remaining nine months of the year. Include too many of my beloved architectural plants, like agaves, yuccas, or the gorgeous shrubs like the dark lophomyrtus and golfball pittosporums pictured, and you can unwittingly achieve stasis, gorgeous though it may be. My eye (and nervous system) craves the changes that ephemeral plants bring. It’ll be interesting to see if that ruby grass near the center, Melinus nerviglumis, blooms well in this spot. And when the purple orach is finally cut down, that dark smudge between the pitts, Salvia canariensis planted behind the orach will be visible and just might be in bloom for fall. If not this year, then the next. Behind every blogger’s garden photo is a cold calculus, a complex web of reasons behind why those plants pictured were grown and why others perfectly amenable to that zone weren’t. And what can look overwrought to some can be sorely lacking in excitement to others. I would love to seat Deborah Silver and Keeyla Meadows together at a dinner party and eavesdrop on their discussion of this subject. 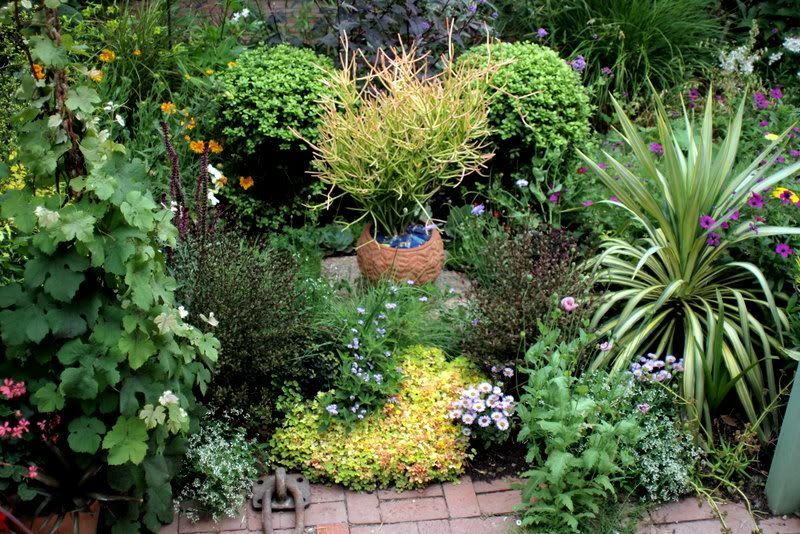 Deborah in Detroit, with a very short growing season, favors a timeless, classical approach, clean lines, no strong contrasts, a celebration of green, with color provided mostly by annuals in pots. A friend arranged for a visit to Keeyla’s chromaphilic garden near San Francisco last week, and Keeyla apologized for the lull in flower interest and color. She needn’t have. Sensory overload never looked so good. Keeyla would doze off in my garden. What would Deborah garden like in San Francisco? Some years the garden’s legs are stronger than others, but every summer brings its successes. By July, it’s fairly clear what counts as success and what doesn’t (alliums again). One thing I’m very glad to have planned for this summer was sowing a few Centhranthus ruber, white valerian. I know I may have ended up inviting a rambunctious character into the garden, but for now am just enjoying how its billowy clouds unify the garden and give it legs this summer. 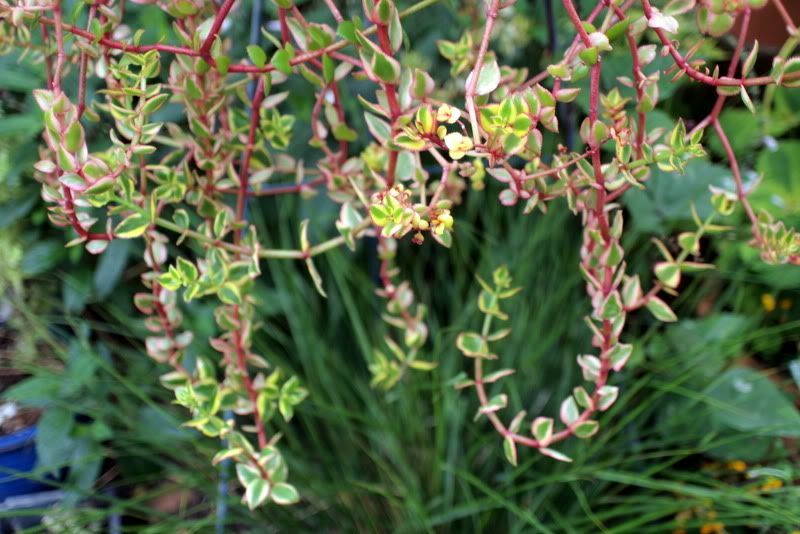 I love the golden trinity of the New Zealand wind grass, the Sedum nussbaumerianum, and the Euphorbia tirucalli, moved out of the center in the top photo to make up this triad. The eye ricochets from the deep amber sedum to the grass’s golden fountain like a carrom shot. The medio-picta agaves pick up the white in the valerian. A ‘Hopi Red’ amaranth will soon be towering above the wind grass, making another carrom shot from the ‘Zwartkop’ aeonium opposite. 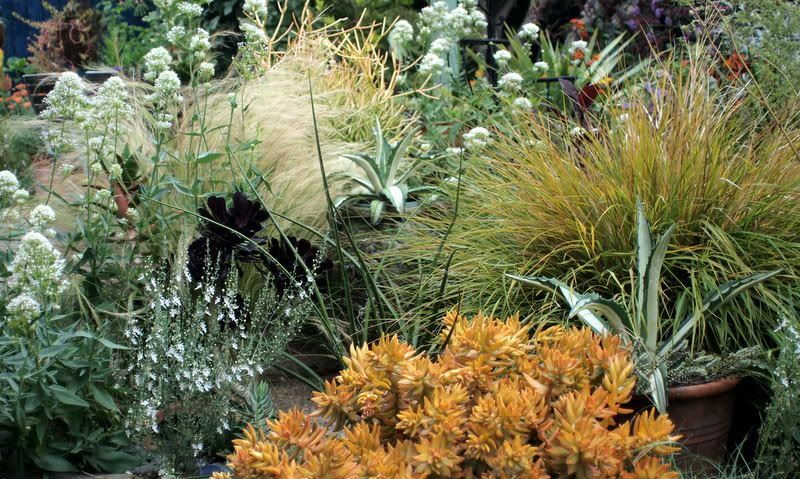 Mercifully, there’s no rule that says every gardener has to select plants from the same genera. In fact, we can skip entire genera if they turn the garden into a shambles by July, some having consumed half the garden’s resources, not to mention the gardener’s resources, by the time they take their leave. For a garden not to collapse mid-summer, hard choices have to be made. Some lovelies with lengthy, post-flowering hangovers will have to be excluded. Modest, simple flowers can be just as enjoyable as those from the more celebrated genera. Allium senescens, brought home from Filoli, planted up close in a pot. Nice leaves too. Some gardeners, even those with enough sun, say no to flowers entirely. 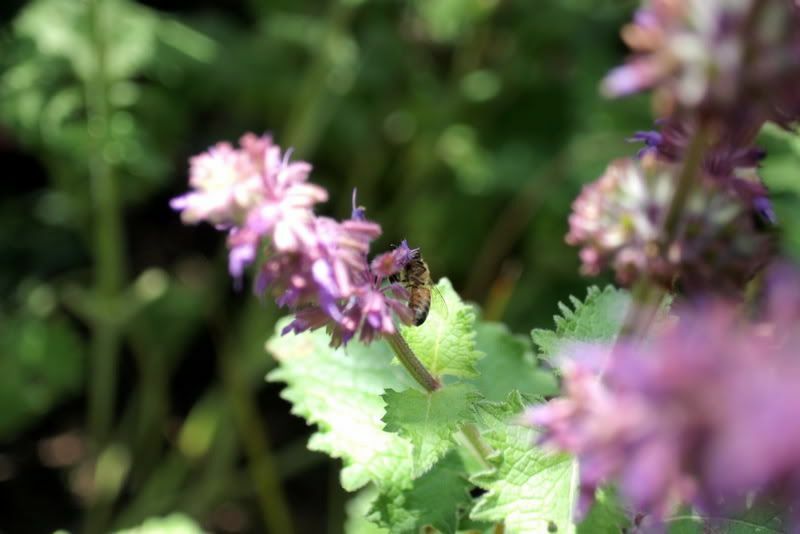 As Uncle Monty in the film Withnail & I crankily opined, flowers are just tarts, prostitutes for the bees. Well, I say let the bees have their tarts, but don’t let their inclusion spoil an otherwise perfectly enjoyable garden. No tarts with mildewy leaves, for example. And either they quit the garden party gracefully and entirely when done flowering or offer up some fine seed heads into the bargain. More legs, now of the literal kind. These are the garden’s Martian walkers or tripods. 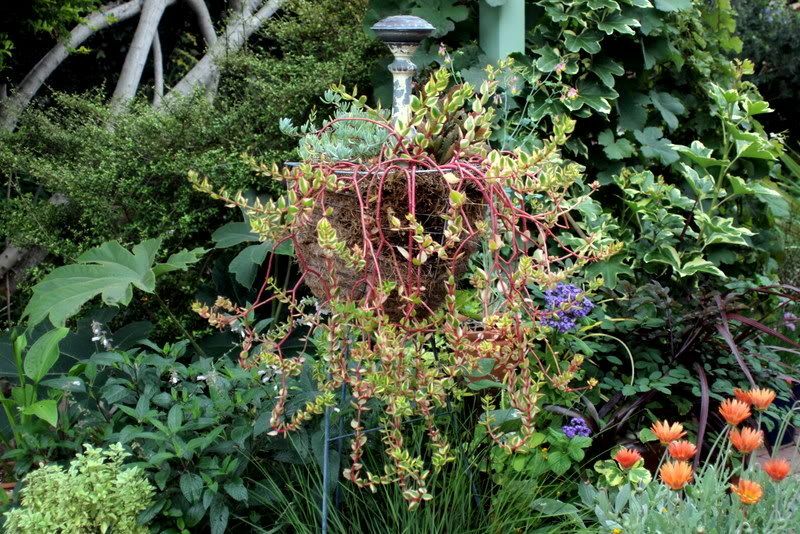 Succulent baskets hang from the top, vines like asarina, dolichos, and thunbergia grow up the green wire bases. This one grows the variegated trailer Crassula sarmentosa. Dolichos lablab vine, unseen in the photo, has reached the top and just started to bloom. Purple pods should be appearing soon. Gardens need legs. Another July, another manifesto. Thank goodness outdated garden manifestos can always be composted. This entry was posted in essay and tagged Centranthus ruber, Deborah Silver, Keeyla Meadows, Withnail&I. Bookmark the permalink. Sometimes those legs will carry a plant right off to the yard-waste bin.And as for those Alliums …firm residents of the plants-I-can’t-grow list.If you’re trying it again this year by god so am I. I will not be defeated by an onion ! Love the photos ..do you mind if I send Cindy a link to your blog? I love your plant choices, marvelous combinations! Bravo. July really is manifesto month, isn’t it? What works is working and what’s wimpy fades away. I like how gardens self-select this way. Master touch to add the white valerian…I’ve invited one into my garden this year as well. Kathy, these are the little drumstick alliums, nothing fancy. They usually do OK here but I don’t know what happened with this batch. Sure, send it to Cindy, but only if she has yours too! Hi Laura, thanks for the kind words. It’s still been so mild here in So.Calif. I wonder how that valerian will hold up in August and if it reseeds true. Wowser, Denise – now I know what you’ve been up to in your “spare” time — lovin the blog – you always have a wonderful, masterful way with words — and plants. I’ve had the valerian seed true but be short-lived for me in my Z — likely because of growing shade and fertilized clay…. 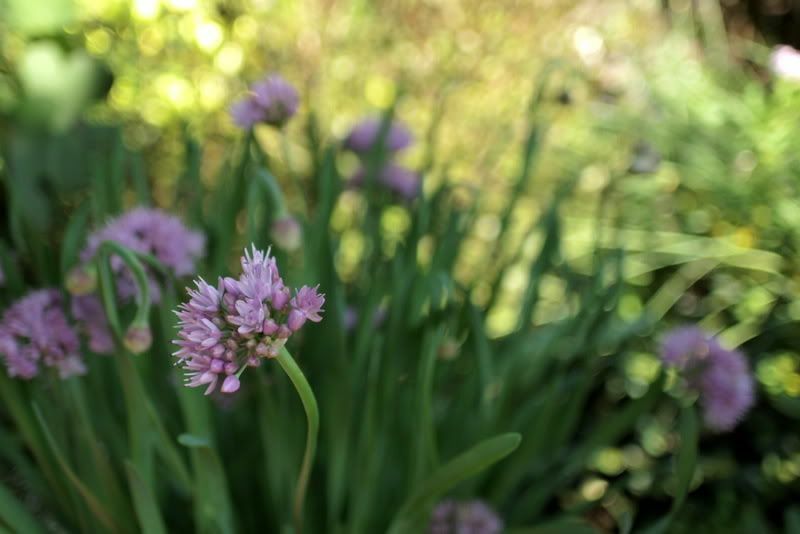 but it’s lovely when it behaves and thrives – I imagine you’ll have the over-enthusiastic response in your garden. 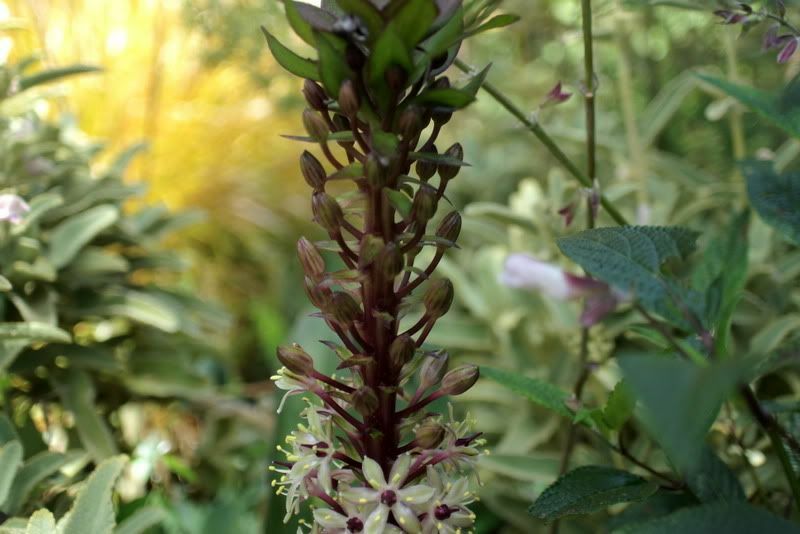 It sure looks great with that perfect of all succulents, the A. medio-picta alba and that grass – great stuff you’re composing in your garden as well…. Cindy, so nice to have you stop by!